We need adults who believe in our mission to help with the crucial process of picking up produce from the Leucadia Farmers Market on Sundays and Delivering it our Receiving Agencies located in South San Diego near downtown San Diego. 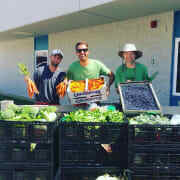 You would be providing fresh produce to San Diego's food-insecure children and adults. We currently provide over 9,000 servings each week to the most vulnerable populations in San Diego. Passionate about Food Recovery and feeding people in Need! ProduceGood is a local nonprofit whose mission is to build an active and engaged community committed to finding sustainable solutions to alleviate hunger, reclaim and re-purpose waste and promote the health and well-being of all. We need Volunteers On Sundays from 2:00pm to 4:30pm. You can volunteer one Sunday a month or 4 Sunday's a month, we'll work around your schedule. We ask for a minimum 3 month commitment.